Though the house is old and the paint is fading, the mother bluebird can still create a loving home for her young. The dogwood tree is in bloom, which means it is spring and new life is about to enrich the neighborhood. This watercolor gives a bird’s eye view of the simple life of the bluebird. The artist, Dempsey Essick, loves bluebirds. He is the past President of the NC Bluebird Society; he feeds bluebirds daily and speaks publically on the plight of the Eastern Bluebird. 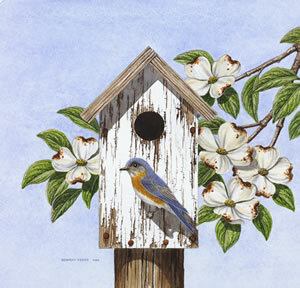 “Box Watch” is the most recent addition to Dempsey’s collection of bluebird related art. The rebus image of a hummingbird is hidden in the chipped paint at the 1:00 position from the bird box hole.